Scientists have been making scientific observations and collecting data on the Arctic Ocean for well over a century. Most of the data have been collected as part of specific research projects, without emphasis on building long-term observing system. This means that much of the data collection has been scattered and sparse, and with a few exceptions there has been a lack of systematic, long-term observations of the Arctic and sub-Arctic seas. The Arctic Regional Ocean Observing Systems, or Arctic ROOS as it is more commonly known, has been established to promote and develop operational observing systems based on satellites, in situ sensors, and modelling systems. Arctic ROOS is an IPY project (project no. 379: "IPY Operational Oceanography for the Arctic Ocean and adjacent seas," which is coordinated by Prof. Ola M. Johannessen of NERSC). The project aims to collect and integrate data from in-situ observations (ships, moorings, buoys, and floats), remote sensing (satellites and aircraft) and numerical models and data assimilation. Arctic ROOS will contribute to the International Polar Year data legacy by maintaining cost-effective and useful observing systems after the end of IPY. Founded in Luleå, Sweden on 18-19 December 2007, Arctic ROOS was established by a group of fourteen institutions from nine European countries working on observing and modelling the Arctic Ocean and adjacent bodies of water. Arctic ROOS was developed as a regional component of the Global Ocean Observing Systsem - GOOS, which was started in 1991. The main contributions to Arctic ROOS are provided through projects funded by the EU, EUMETSAT and ESA, which include: MERSEA (Marine Environment and Security for the European Area), DAMOCLES (Developing Arctic Modeling and Observing Capabilities for Long-term Environmental Studies), EUMETSAT OSI SAF (Ocean and Sea Ice Satellite Application Facility), Polar View (conglomerate of various institutes specialising in earth observation), and Satellite ice data from the Institute of Oceanography at the University of Hamburg, Germany. An Arctic ROOS secretariat has been established at the Nansen Environmental and Remote Sensing Center (NERSC) in Norway. Dr. Stein Sandven, Research Director at NERSC and coordinator of Arctic ROOS, agreed to spend some time with Science Poles to discuss the direction of Arctic ROOS and the future and importance of monitoring the Arctic. All of the institutions participating in Arctic ROOS already monitor various parts of the Arctic. Is Arctic ROOS just a way of having all this data collected under one umbrella? All of the member institutions taking part in Arctic ROOS have been collecting data in the Arctic for many years and play important role in the development of new observing systems. At present there are several new initiatives to increase ocean data collection in the Arctic. Arctic ROOS is focussed on producing daily observations as well as long-term monitoring data and to disseminate the data to scientists and the public in general. We only started the organisation at the end of last year, and we are developing a working plan for the organisation. This is something we'll discuss when we have our first annual meeting on 5-6 November in Helskinki, Finland. We also have website that allows the member institutions of Arctic ROOS to present all the datasets they collect on the Arctic and sub-Arctic regions. The member institutions have several ongoing activities, producing satellite-based observations data, in-situ data and development of modelling and forecasting systems. Each member institution has its own website where you can find the same kind of data that's featured on the Arctic ROOS website; however having it all in once place increases the visibility of our member institutions and it shows how all of their research and observation activities complement each other. Is there an effort to coordinate and cross-check data form different data sources from the different members within Arctic ROOS or does each member of Arctic ROOS simply present its data at this point? There are efforts to come up with a harmonised picture of the situation in the Arctic by comparing observations from different instruments and also by comparing simulations to observed data. There is a strong interest in making a synthesis of all the research from the different methods. But right now the biggest problem is simply a lack of observations, especially from the subsurface and the deep ocean. Arctic ROOS and its member institutions have an overall goal to develop operational oceanography activities in Arctic and sub-Arctic regions. We hope to improve data collection and observation in the Arctic by improving the monitoring systems that are taking measurements there and deploying more in-situ moorings and weather buoys. What is the current situation of the data collection in the Arctic? Ocean observations are quite sparse, actually, except for the surface where satellite data play an important role. The Arctic Ocean is probably the least observed of all the oceans as far as subsurface observations are concerned. It's a harsh environment and thus more difficult to deploy observing systems there. But now we've got the IPY, which means there are more observation activities going on, and many research efforts are testing new sensors, new equipment and so on. But after the IPY finishes, we expect observation activities to slow down again. So now we feel it's important to try and increase observation activities in general so that hopefully there will still be a sizeable amount of observation activities after the IPY ends. What kinds of systems are used to observe the Arctic Ocean? If you look at the ice-free areas of the Arctic such as the Norwegian Sea, the Barents Sea and the Greenland Sea, you can use most of the standard ocean observation methods used for the more temperate parts of the planet such as satellite observations, ship surveys, ARGO drifters (autonomous monitoring systems that float between the surface and the deep ocean and providing new data every 10 days for use in climate, weather, oceanographic and fisheries research), and moorings that measure ocean currents. When you come to the ice-covered part of the Arctic Ocean, however, you have more limitations. You can't use ARGO drifters or ships to collect data. You can use icebreakers to assist ships in doing surveys perhaps, but it's not very practical. There are, however, ice buoys that have been deployed on the sea ice, which measure ice drift, and there are a few measurements from a network of Arctic buoys. But apart from that there are only a few places in the Arctic Ocean where any sort of regular monitoring is going on. Satellites are playing a more and more important role, but they can only observe the surface of the ocean. You also need data form the deep ocean, which means installing buoy systems and float systems that can take measurements in the depths of the ocean. In the Fram Strait, for example, there is a corridor of moorings that has been making continuous observations for the last ten years or so. But the Fram Strait is only one place in the Arctic, and there are many other places where you have virtually no observation going on. Do you think there will be new monitoring projects in the future? One of the most important tasks of Arctic ROOS has is to encourage the development of programmes that can obtain long-term data on regular basis. With the increasing interest in the Arctic we've been seeing over the past few years, we think there are a lot more opportunities to develop a more comprehensive Arctic observing system than there were a few years ago. In general monitoring and research activities in the Arctic have increased quite a lot in the last few years, and I do not expect that these activities will decline in the coming years. The Arctic Council has initiated Arctic programmes, such as those that monitor the Arctic atmosphere air quality. Right now they're initiating a programme called SAON, which will encompass marine observing systems such as Arctic ROOS and others studying terrestrial, atmospheric, marine and even anthropological aspects of the Arctic as well. There's also a new EU project called My Ocean (PDF Document), which is funded under the EU's Seventh Framework Programme. The project will implement operational modelling and forecasting systems in the European seas, including the Arctic. The most costly aspect of Arctic Ocean monitoring will be to install moorings, floats and buoy systems, and this will require funding from several projects and programmes in the next decade. Once the IPY has ended, will it be logistically and financially possible to continue the same level of observation that's being conducted right now? One major problem is to establish funding for long-term monitoring activities. Until now most of the monitoring has been financed through research programmes, which generally last only a few years. The DAMOCLES project, which is a large-scale integrated project with about 50 member institutions (many of which are also members of Arctic ROOS), is an example of a project that produces significant new observations of the Arctic Ocean. DAMOCLES will be completed by the end of 2009, so it is an open question how much of the observing systems will continue after 2009. We need long-term observing programmes that last for decades or even longer. What do you think would be the best way to convince government officials of the need to continue Arctic observation programmes? In general, with increasing interest in the Arctic there should be good possibilities to install and maintain observing systems for the Arctic. Governments understand there are good reasons to have Arctic observation programmes, but it has very much to do with politics and what each country wants to do in the Arctic, whether they want to start any kind of programme there. As I said earlier, the Arctic Council has initiated long-term monitoring programmes, so I think that the Arctic countries could also generate programmes for ocean observing systems. 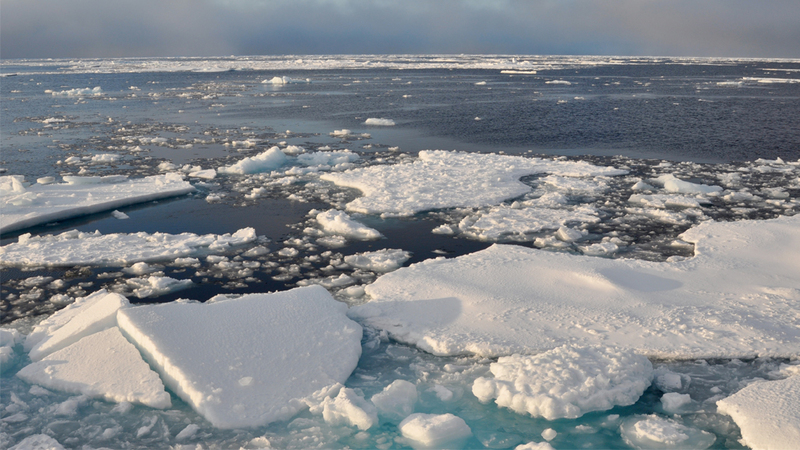 The EU is also interested in the Arctic and can potentially start up new Arctic programmes. Would private sector end-users of this data be willing to help finance some of the observation programmes as well? Absolutely. Oil and natural gas companies interested in exploration in the Arctic very often support research and monitoring activities, which can help fill in some gaps. But there's still a lot to do. There are some oil and gas companies that have started some of their own Arctic research programmes, but they're only in the beginning phase at the moment. Maybe we'll see more of this in three to five years, but it will depend on what's happening in the oil and gas industries. But the general perspective is that the Arctic is becoming more interesting for oil and gas exploration, so we expect these observing programmes to continue to develop. What challenges lay ahead for Arctic observation? A major challenge is to build up expertise and capacity to develop new observing systems for the Arctic. This means that we have to stimulate more scientists and technology developers to specialise in the Arctic. We are therefore recruiting students and young scientists to work in the Arctic, and one of the good things about the IPY is that it has increased the interest in the Polar Regions among young people. In the next decade we expect to see a whole new generation of Arctic scientists who will develop Arctic observing systems further. Dr. Stein Sandven is the Research Director and Director of Polar Environment Remote Sensing Group at the Nansen Environmental and Remote Sensing Center. His research interests include acoustics,oceanography remote sensing, and sea ice.